Do you want to buy or sell a trailer? Download this trailer bill of sale document. A trailer is often an unpowered vehicle towed by a powered vehicle for an example a car or truck. It is commonly used for the transport of goods and materials. There are all kinds of trailers: travel trailers (mobile home), boat trailer, truck trailer, bicycle trailer, constructions trailer, semi-trailer, horse trailer, frac tank, utility trailer, dolly etc. When you want to buy or sell your trailer, it is important that both seller and buyer sign a bill of sale to make sure no troubles can arise after the transaction happens. 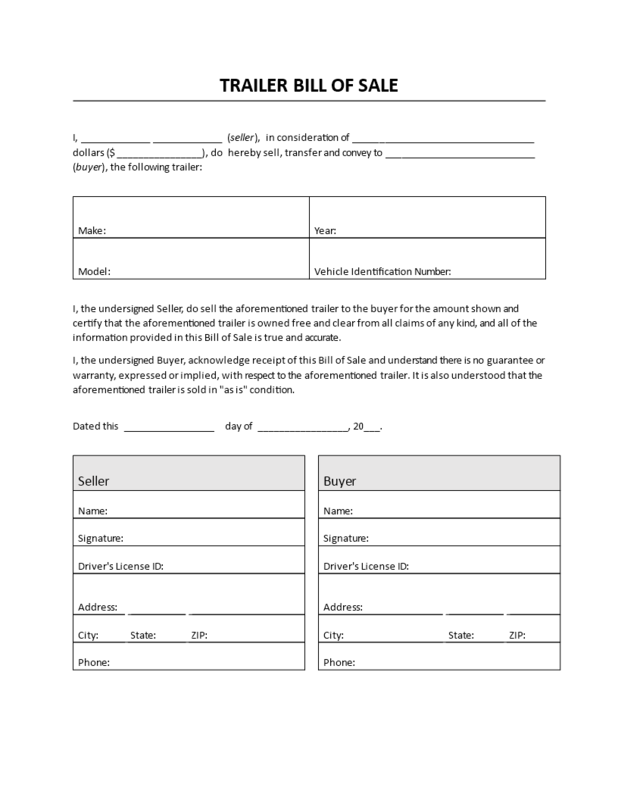 This bill of sale template can be easily used, adjusted and printed to complete the transaction. This template is only an example. Because the jurisdiction per country and state can vary you should consult with an expert or notary.